Select icon to go to preview materials (in Chrome ONLY). Preview materials MUST be accessed through the Lockdown Browser on the desktop. The above icon will NOT connect to preview materials. 2. 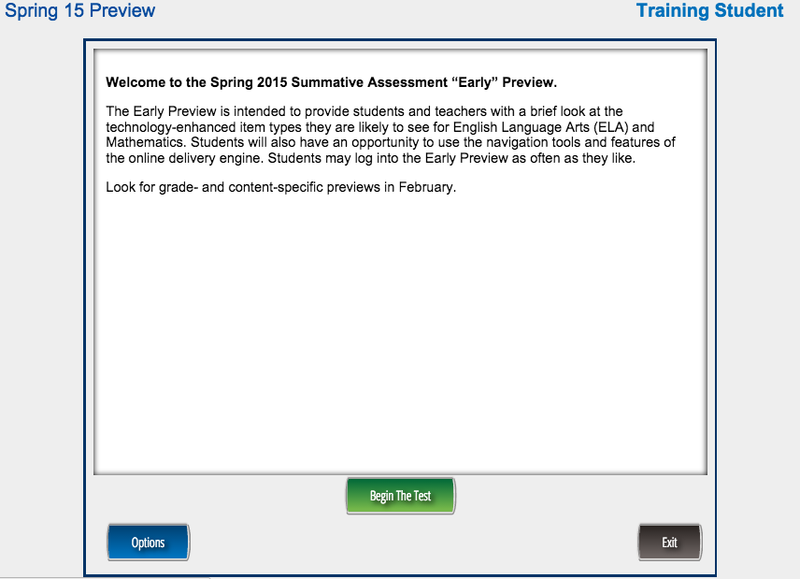 Choose from Spring 2015 Preview, Sample Item Sets, or Calculator Practice. 3. Login in with the Username and Password provided in the login window and select "Sign In". This will be the first window accessed through the "DRC Insight" lockdown browser. For PREVIEW: use Username and Password provided in the login window. For TEST: Students will be provided with login "keys". Students will navigate through multiple screens to see instructions on how to use the test tools. Students select "Begin The Test". To choose and change answers. To mark off answer choices that are believed to be incorrect. To highlight information- it will also work on graphics. To type notes to make reference to (once a note is deleted it can not be accessed again). To enlarge information on the screen (COMMAND/CTRL + will not work during test). To track a single line of text as it is being read. Indicates "More Text Below" and "More Text Above" and could be present on both sides of a split screen. Select and drag to reveal text. Scroll Bar also appears in some Mathematics questions. Some test questions will require a typed response in a white response box. Some "Text Input" response boxes may limit the type and number of characters entered (numerals rather than letters). This limitation will be shown under the box. Some test questions require multiple answers. "Reset All" clears all answers for that question. Select "Undo" to reverse last action. Select "Redo" to repeat last action. *Some questions ask students to choose more than one correct answer. Available when question requires a typed response. It is unclear if this feature will be in the ELA test. To see the first question. To pause if student needs to leave temporarily- test will time out if not paused. To continue after pausing- if less than 20 minutes. To navigate through questions (some questions are multiple pages). To find information on Using Help, Test Directions, Tools, Navigation, How To, and Options . To be sure that all test questions have been answered. To return to the questions after a review. ﻿To mark a question to review later. A flagged question is visible in the question window and in the "Review" window. 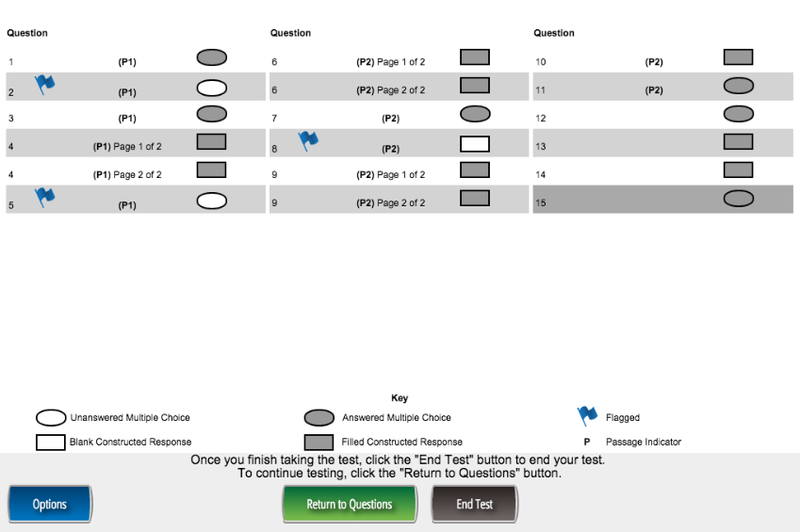 Allows student to see how many questions are in the test. 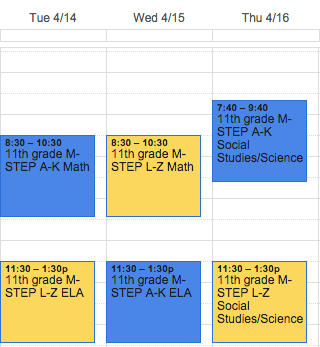 Also allows student to skip questions (which is not encouraged- the "Flag" tool should be used instead). It is unclear if this feature will be on the actual test. To end the test- student will be reminded one more time to review or end the test before exiting the test. To be selected when student wants to permanently exit the test. Test can not be re-entered after selecting "Exit". Returns to login window. Grade 11 English Language Arts and Mathematics sample item sets are designed to help students work through questions (that match M-Step online test difficulty) with the tools available. There are no questions on the Calculator Review. Teachers are encouraged to use the Calculator Review during regular classroom work. The Preview does not have a calculator option. The 11th grade Mathematics does have a calculator option for appropriate questions. 11th grade should choose "Scientific". This will only be available for certain questions and question types. Can be open when another calculator is open. This will only be available for certain questions and question types. The proctor will begin the testing session on a proctor console in the same lab where students are being tested. Students will access the online test through the "DRC Insight" lockdown browser. 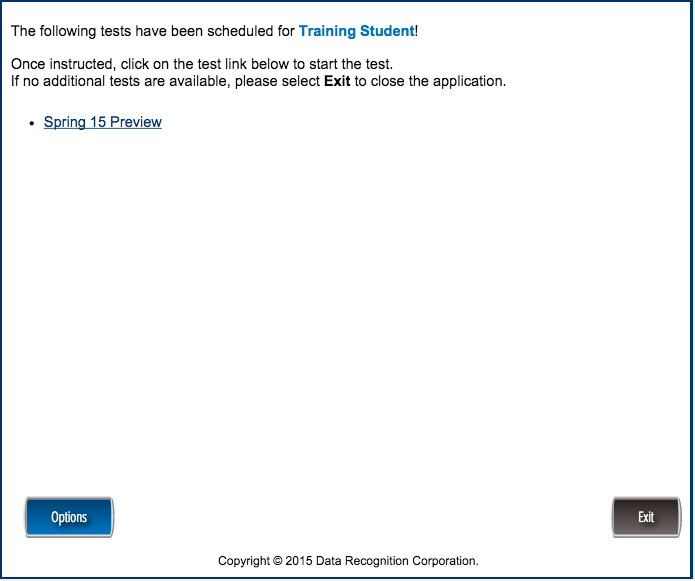 Once students select this test icon on the desktop no other applications will be able to be accessed until the test is ended. Practice hints will NOT be on actual test. If needed, headphones will be provided by BALAS. Students are encouraged to bring their own. No Bluetooth headphones are allowed. Instructions for proctors are not available at this time, but will be provided before testing begins. Please review this material before you proctor a test. Ms. Stocker-B will be available to assist with problems in the PC labs. Ms. Colby will be available to assist with problems in the Mac labs.